A little smaller than my old one, which I broke dropping on the tile floor but it works and that's what counts! Ordered this little gadget to see if it actually worked. I soaked it in water for 15 minutes then added it to my opened brown sugar bag. It keeps the sugar nice and soft. Great item. Keeps brown sugar moist. I was tired of hard brown sugar. Tried this. It works so well that I bought another one for granulated sugar. Awesome product. I used to put apple slices in my hardened brown sugar, but this will be a big improvement! I love the sugar preservers, they really work and I no longer have lumpy sugar. I use it in my sugar cannister and it has worked very well so far, no more clumping or hard lumps. It's too soon to tell if it will still work after a few months but I'm expecting it to as it has worked just right up to now. I had bought one of these "brown sugar saver" and it really worked so I bough another one. Now, (finally!) the brown sugar doesn't get as hard as a brick! I use this in my glass jar of brown sugar. Keeps it just like new, fresh and lumps or bumps. This little gem does exactly what it says, keeps the brown sugar from clumping! I bought two awhile back, one for light brown sugar, one for dark brown sugar. Ended up giving one to my son, so here I am back to replace that one. I bought one of these about 2 months ago, prepared as directed and put it in a ziplock bag with a brick hard block of brown sugar. It was slow to soften the brick so I put it on a shelf and forgot about it. I pulled it down yesterday expecting it to be hard but it wasn't. The entire contents of the bag was soft and fresh. Good thing because I will need brown sugar this weekend and was not looking forward to buying another box and tossing the bulk of it. These are great, wheather your keeping sugar in storage containers, or your counter top cannisters. I have used it when I still had some in the store bought box. Keeps brown sugar moist and lump free. I can slip this right in the package and I don't have to worry about if my brown sugar has harden up. This really works well to keep brown sugar soft. I have used one before and accidentally ordered one this time. But it's okay. I will gift it to someone. I know how well it works. Since I started using the Brown Sugar Preserver, I have had no hard or lumpy brown sugar. I love it! I used to use a piece of bread but that would get hard and roll into a ball. It took up a lot of space. The Brown Suger Preserver not only takes up less space but it also does not get bulky. Purchased several of these to give to my girls and of course one for myself! Wow...these little things work! Now my raisins and brown sugar will remain soft. Love them. was surprised by the size, soaked it like instructions said the little bit of brown sugar I had was no longer hard. It was like I just bought it. Going to buy a couple more. No more waste of dried out food. I've looked everywhere for this disk and was so happy to find them at Walter Drake! All you have to do is soak the disk in water, blot dry and insert it into your brown sugar canister and no more hard brown sugar!!! When the disk dries out just repeat the process, it works over and over again. I bought two, and use the second one in the cookie jar with molasses cookies, keeps them soft too! This works great in my brown sugar. I'm getting these for Christmas presents! They're great!! Solved my long time hard brown sugar problem. Will buy for Christmas gifts! It only take 15 minutes to soak. Then, no more hard brown sugar. I had a canister of brown sugar that had completely hardened; I put the disc in the canister, and in a day or so, it was soft and useable. The directions were so simple. I've been wanting this product and couldn't find it in any store. This product really works! My brown sugar doesn't get hard and stays soft for a very long time. I gave this as a gift to my daughters and they were both thrilled at the prospect of keeping brown sugar fresh in the pantry. I think it's a wonderful idea. I bought because my Mother had and works great! Amazing, would buy it again, and will tell others about it!! Keeps my brown sugar moist. I use this product not only to keep light & dark brown sugars soft...but it is just as effective in keeping marshmallows, dried fruits...raisins etc. fresh & soft. You can use it again & again...merely soak the disc in boiling water for about 15 minutes...dry off and place it on the bottom of your container. It woks exactly as it's supposed to. Even if you have rock hard brown sugar, soak it for 5 minutes put it in a sealed container and in a few hours it's perfectly soft & ready to use. THIS PRODUCT REALLY KEEPS THE BROWN SUGAR SOFT!!! I have had this for several weeks and the brown sugar has not become hard as it normally does. This is a great buy at this low price and it really works! bakers like I am and I know they'll love it too. It requires no work or effort on my part. I love to cook but not a baker so my brown sugar sits around for a while and the brown sugar preserver works well to keep it nice and soft and ready to use when I need it. Use to keep brown sugar soft. My mother bought the disc to keep her cookies soft and chewy. It works great for that purpose. I put this in brown sugar after following the directions to add moisture. So far it has worked in keeping the sugar soft with no lumps. I have bought many of these over the years. Make sure to soak it according to instructions. I keep one in the brown sugar, of course, but have also found other uses. For instance, I keep one in the cookie jar and one in my jar of calcium chews to keep them soft. I have had one of these before and it hsa disappeared. I was glad to find it in the catalog and have it in the brown sugar as we speak. It really does work. This little disk is so very usefull. I have never seen one at any store and it works so well. Brown sugar is a tough one to store and this little disk makes it so easy. It keeps it moist and ready to measure at any time. I love this little disk. Finally something has come along that really keeps brown sugar from getting as hard as a rock. I have used these for years and have bought them as gifts for friends. I never have to deal with hardened brown sugar when I use these. Here is a simple product that works perfectly! Worked miracles on the sugar. Back to get one for mom, too! I love it.! No more chipping away. We do alot of cooking.This divise is is God send.After a month of use my brown sugar is still perfect. Keeps brown sugar nice and moist. This clay disc is great for keeping brown sugar moist when ever you are ready to bake. I gave my friend one as a gift. I have seen this same product in high end gift shops at almost twice the price. I knew they work well and wanted to purchase one for my brown sugar container, and an additional one to rotate around to other food items in my pantry. I am pleased that I was able to purchase these at such an affordable price. may look small, but really powerful!!!!! Really keeps brown sugar soft! Just what I needed as my husband lost the first one. I've been using these for years.....keep brown sugar and regular sugar from getting rock hard. Just keep it moistened, put it in the bag and that's it....no more throwing out hard brown sugar. These just ordered are for my daughter. Followed instructions. Put it in a jar with very hard sugar. Within hours it was soft and usable. everyone needs this fo the Brown sugar jar, Love it. Use it in my Brown sugar jar, Keeeps it from get ting hard. I have nothing to say negative about this article. It softened a bag of sugar that was hard as a rock! I can't say enough good things about it. Wonderful product. As stated, they won't fit into a regular size Mason jar. In Florida I keep many things in jars to keep out bugs. The terra cotta circle is too large for the regular-mouth jars. I keep a few wide-mouths on hand just for this purpose. They are truly wonderful, tho, and I have been using them for years. Give one to every cook you know! 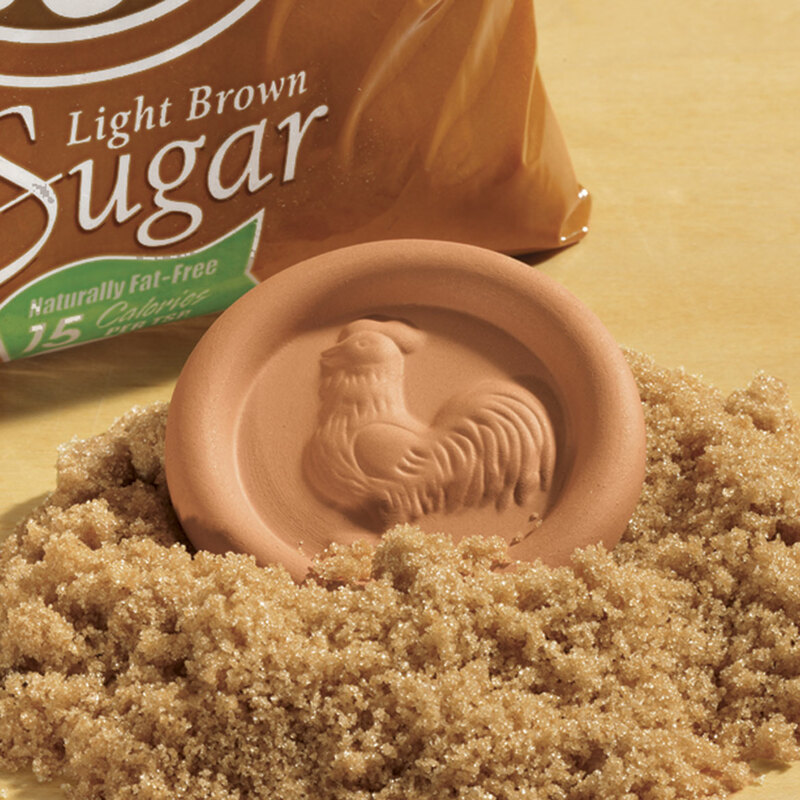 I have had a Brown Sugar Preserver for years and have bought one for everyone in my family. There is no way the sugar is going to get stale with that thing in there! So simple but it really does the trick! Love this product. works like magic, buying one for my daughter by request. These brown sugar preservers really work. We got them for friends that we know that bake a lot and so use brown sugar!! Brown Sugar Preserver is just what it says. Keeps it soft and ready to use each time you go for it. If you have trouble keeping your brown sugar clump free...try the Brown Sugar Preserver. I have been using these dicks for years, but I dropped mine and needed a replacement. I bought 2 just in case. It does keep the moisture in the brown sugar and keep it soft. You need to remember to re-wet it every-so-often to keep the sugar soft. I'm very happy to have a new one. As soon as I put this preserver into my jar of brown sugar, it softened it, making it easy to scoop. It's amazing how fast and well it works! was so tired of needing a hammer to get my brown sugar. So nice to just open and scoop out, with a tsp. I put the disc into a hard bag of brown sugar. It was soft brown sugar the very next day. Great product! I added the soaked brown sugar preserver in water as directed and placed the dampened off disk in brown sugar that was at least 8 years old and so hard you had to use a hammer to break off chunks. The next morning the brown sugar was just like out of a fresh bag. This fat old Grandpa was very impressed. Brown sugar turns into a hard rock here in the southeast Arizona. The preserver helps keep it nice and moist for better use. How many times have you gone to the pantry to use your brown sugar to find it in an unusable state because it is hard as a rock? This product is for you- simply place this disc in with your brown sugar and the moisture keeps that sugar soft and ready to use when you are ready to make just the right recipe. Perfect hostess gift, stocking stuffer or extra "tag" to adorn the bridal shower present. A must to have for every "well stocked" kitchen! This was the perfect gift for every cook on my list at Christmas... perfect stocking stuffer. Even my mom and mother-in-law who are hard to buy for loved it. At this price, you can afford to give them to friends too! Put it in the open package of brown sugar. I have used the Brown Sugar Preserver for years and have given many away as gifts/no special reason. It is a product that lasts and does what it claims it will do. I always wanted one of these because simply my brown sugar would get so hard, and so it can't be used for measuring. You end up throwing it out! I didn't think this was going to work, but I was really surprised. I wouldn't hesitate to recommend this or purchase another one as a gift. The wafer works perfectly, even after a month in the canister. The sugar is soft and moist. I noticed this item a few times before I purchased it. When I received it, I immediately ordered 6 more as little Christmas gifts for friends and family. It's such a small thing, but it is so useful and really works to keep the brown sugar from hardening. I'm thinking of combining it with a glass jar with a tight lid and a box of brown sugar to complete the gift. Wow it is great works just like it says!!! This item does just what they say it will do. It keeps the brown sugar soft after it has been opened. Had a partial box of brown sugar that was hard. Added the disc and it is O.K. now. Works well. If you follow the instructions the product works beautifully. For the money its well worth it. The only draw back is after a time you have to soak it in warm water per instructions to preserve it. But its all worth it. I use the product daily and it keeps my brown sugar and cookies fresh and moist daily. I was so happy to find another preserver for my brown sugar.package. (I dropped the other one and cracked it). I am amazed at how well these work. I like having freshly fine brown sugar for my recipes. If anything happened to mine, I would immediately get another. Have had mine for years now. I don't use brown sugar often so it was always getting so hard as to be unuseable. I keep the brown sugar and disc in a plastic container which may help but when I was just putting it in the box, it still worked well. Every once in a while, you need to drop the disc in water. I drop it in and take it out in an hour or so. Then I sit it on the counter for another hour or so and put it back in with the btrown sugar. I may go as long as a year or more and the disc still works just fine. If the brown sugar is already really hard, you may have to do the soak/air dry/put in package routine a couple of times. I already had one of these. I bought this one for a relative. Know this will work just as good for them as it does for me. A simple, unassuming little thing that does exactly what it's supposed to without fuss or bother. Has kept my brown sugar soft for over a year, all the way to the bottom of the cannister. This disc keeps the brown sugar soft and measurable after multiple uses. I want all my relatives and friends who cook to enjoy this simple solution to brick brown sugar. I had one of these disc before and gave it away. It actually does what it says it will do...absorb moisture to keep brown or white sugars from clumping. No more pounding hard brown sugar or trying to crumble it in your hands. LOVE IT! I couldn't wait to get mine and I trust it will work well. I soaked it as the directions stated and then I placed it in the brown sugar. 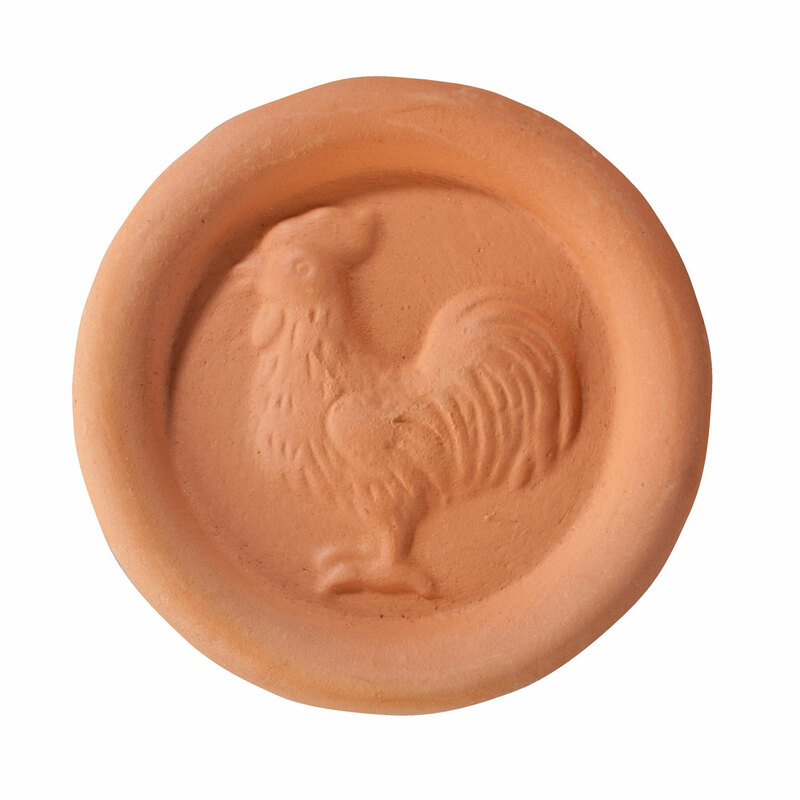 I believe in the efficiency of terracotta as I have a terracotta pot that I have had for a long time. I use it to cook roasts, potatoes and carrots. The meat falls apart and is so moist. I have no doubt this will work in the brown sugar. This little disc has been great. No more wasted hard sugar. This works great keeping the brown sugar moist, by wetting the clay piece and putting it in the brown sugar container. I have been looking for one of these for quite a while! Got one for my chef daughter and myself! It works like magiic. No more lumps. I just soak it briefly each time I take some brown sugar out of the canister. This is the best investment, I could've made! I no longer have to use bread slices to soften my brown sugar. I prepared the wafer, and put it in my brown sugar canister 1 month ago! It is still soft and moist. I am going to use one for my coconut also. work great for brown sugar and raisins. work really well. be sure to wait 15 mins after wetting stone. I put one in my old sealed brown sugar bowl and ever since, not only did it soften the hard sugar, but has kept every thing soft. I thought that I would give this product a chance, since I am one of those people that go to reach for the brown sugar, only to discover that it is rock hard. Even though I tightly wrap and tape the package closed, I would always have the same problem. I guess from not using the brown sugar that often, it would sit and therefore start to harden. I definitely would recommend this product for anyone that likes cooking, from the home cook to the super chef. You won't believe it--it does work!!! I bought this mainly for the sole purpose of keeping my brown sugar soft. So far so good! I love them !!! Bought 2 more sets for my daughters. Had mine over 6 years. Extra bag of sugar got like a cement block. I put it in a tupper bowl, with disk. Every other day soaked the disk in water. in 1 week the brown sugar was soft again . Bought 2 more sets for my daughters . i already have 2 of these .now i have 3.these really work .no more hard sugars to contend with .scoops out easy or pours easy .i gave one as a gift .there is nothing bad about this product . A must for brown sugar! This is an awesome little product. My brown sugar was hard and lumpy when I put this disc in and it softened the brown sugar overnight. I wish they made these for regular sugar and salt. I followed the directions. I then put the preserver in my large jar of hard brown sugar. A few days later the brown sugar was moist and ready to use. Fantastic! I received this as a gift from a friend. It worked so well I bought this one for my daughter. I got serval for frineds and family for Christma and so far they love it. It was actually a surprise because no one had one, I love the unique. I also got one for myself. I know it will work great in my brown surgar. Follow direction on it and you can use it for a long time. I would recommend. I like this because it really works to keep your brown sugar just like you just opened the package. Very little waste. If you buy brown sugar and have some left, it gets hard. Breaking it up is difficult. Instead of pitching the dried hunk of brown sugar in the trash, buy one of these discs. Soak it in water per the included instructions and put it in your container of brown sugar. Next time you reach for the brown sugar, it will be soft and ready for your use. I have always had trouble with the brown sugar. I saw it in the catalog and decided to give it a try. After soaking it in the water, I put it in a container of brown sugar which was already hard. I checked it the next morning and much to my surprise all the sugar was soft. I love it. I hate lumpy brown sugar that gets so hard you can't use it. This is a simple solution. This items really does keep brown sugar moist in our dry climate! Keeps brown sugar from getting hard and lumpy. Always wanted one. Great buy & product. I've wanted one of these brown sugar keepers for years & just never remembered to get one. After years of having to throw out perfectly good brown sugar. I saw this on Walter Drakes website. As soon as I received it I put in in my sugar. It's doing what its suppose to. So happy with it. I bake constantly. I also hate wasting expensive ingredients due to them drying out. All you need do is soak the disk overnight, dry it off and put it in with your brown sugar inside a sealed container. When I received this I immediately placed it in my bag of brown sugar that I had to break apart with an ice pick. Within 30 minutes it was completely soft and usable. I don't know how I ever got along without it. I ordered 6 more, 1 each for my 2 daughters-in-law and 4 married granddaughters. Just drop the disk in and it keeps the brown sugar soft. Old reliable! Still works perfectly. I'm old enough to have used one of these for decades. Actually, I stick one in my sugar jar, salt jar and any item that tends to clump or harden when I do not want it to. So far it does what it says it will do. sugar is no longer one big lump. I am very pleased with this item. It is easy to use and keeps my brown sugar nice and soft. It even got rid of some lumps that were already in the sugar. Easy to use and it keeps the sugar soft. put in my brown sugar and it really works. Keeps it soft. I love this brown sugar saver! I have thrown out countless bags of brown sugar because it became so hard that I couldn't measure it, yet alone use it. This is a cute little stone that you soak, pat dry and store with your sugar. Keeps it soft and fresh! These little clay discs actually work. You just wet them and place them in the cookie container and they will keep the cookies soft. You no longer have to bread. The only thing is that you have to wet them again in a few days. Don't think that wetting them once and forgetting about it will do the trick. Have not seen one of these in years and was so happy to see again. i plan to get at least one more. I hate when the brown sugar gets hard, so this little disk does the trick, and keeps the sugar soft. When I give gifts, I stick a little disk in the package. Works exactly as expected. Really love this for the Brown Sugar keeper. I wish they had this item years ago; then you wouldn't have to throw the sugar away when it got hard, good item. The packing of my order was very poorly done. The stone disk was crushed by the post office but when I called customer service they immediately got another mailed to me. Very easy to work with. Works, but has unexpected effects. My mother has one of these, and her brown sugar is always soft, so I bought myself one too. Soaked it as directed and placed it in a container with some very hard brown sugar. Lo and behold, next time I opened the container, the sugar was all soft and usable again! Saved me from having to throw it away and waste money. One caveat - some sugar did stick to the bottom of it and had to be pried off. Small price to pay, in my opinion, for nice soft brown sugar. Used to keep sugar soft. I will use this in my brown sugar to keep it from getting hard. Hard to find item,glad you had it! This item for use in "brown sugar" to keep it from lumping or getting hard. It works great with keeping tobacco moist. This is why I got it. This product works very well at keeping brown sugar soft. It is very reasonably priced and is great for yourself and good for gifts. So far most of the sugar stays loose except next to the stone. I purchased the brown sugar keeper disc as gifts for friends. They arrived well packaged and in plenty of time. This works great for my home and in my RV. It keeps the brown sugar soft and ready to use. Would recommend it highly. This product is great keeps the brown sugar from getting hard. Keeps my brown sugar fresh for months. Just re soak when needed and put back in with the sugar. Easy to maintain. I've had mine for years. When my grown daughters saw how fresh my brown sugar was, they wanted one. I ordered two more. It was shipped very quickly. this item does work however I notice the brown sugar sticks to the disk...small problem..and made the brown sugar around it very moist...no problem...I just put a piece of aluminum wrap on one side and put that side in the brown sugar...however my brown sugar was already very moist...so probably didnt need it...a product to use when it starts to dry out? I bought 2 of these, one for my daughter and one for myself and they really work great. I have nice soft brown sugar now. I love my brown sugar keeper so I bought this for a gift. It's very cute and works well. Delighted to have soft brown sugar rather than unmanagable brick hard lumps and pieces.